Chimneys are a central focal point in many homes. It can be used as a placeholder for important photos, mementos, and antiques that we hold dear to our hearts. Unfortunately, there are always seen and unseen forces wreaking havoc your chimney. When it comes to concrete chimney repair, Dayco General Inc understands how to deal with Minnesota’s climate, which can be quite a challenging phenomenon, especially during the winters. The revolved cycles of freezing and thawing typically lead to serious deterioration causing cracks in the stone mortar work of the chimney. Moisture is the enemy of masonry particularly in the winter/springtime of our region. When the water freezes and expands it does damage to concrete chimney tops. This damage starts small and is even imperceptible. As small faults develop in the masonry its expansion begins to allow more water to wick into the material. Ultimately, the damage becomes obvious even to the point of pieces falling down to the ground. 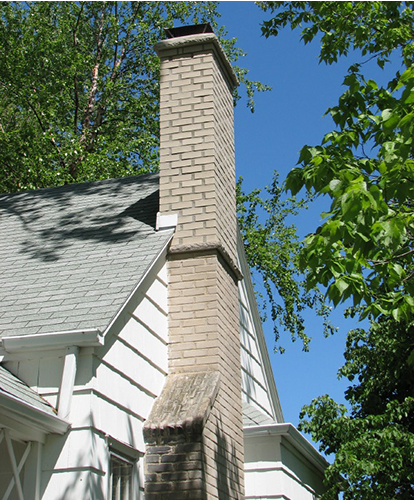 A quality built concrete chimney can be good-looking addition to the outlying appearance of a house. It can also turn into an eyesore if the chimney is damaged and may make the house look blemished. Frequent maintenance can make all the difference when it comes to aesthetics of the home. Concrete chimney and concrete block chimney repair includes but is not limited to a reconstruction of the upper elevations of the chimney, mortar restoration through the process of tuckpointing. Extra enhancements for decorative purposes include the installation of clay pots, stone veneers and copper chimney shrouds customized to your needs. Chimney installations do not have to be traditional and mundane. It can be turned into a masterpiece of art that can be a centerpiece to your home. Here at Dayco General, we specialize in concrete chimney repair. Your chimney has never been in better hands when you trust our skilled tradesmen. We service these Minneapolis metro areas! Plus More!